When I received the first beta of Marco Arment's new app, Overcast, back in May, I didn't think I could use an iPhone-only podcast client with no iPad version and no streaming support as my daily podcast listening solution. Overcast, available today on the App Store, is launching to high expectations and hype for what Arment, best known for creating Instapaper, founding The Magazine, and co-hosting the Accidental Tech Podcast, has been working on since his reveal in September 2013. Two months after putting Overcast on my Home screen as a vote of confidence and using it to listen to podcasts every day, I don't want to go back to any other podcast app I've tried before. In spite of lacking iPad and OS X versions and some features from popular podcast apps, the listening experience in Overcast and its approach to podcast discovery have been so thoughtfully implemented and cleverly engineered, I find it to be a superior choice for my listening habits. I have 20 podcasts in my subscription list, and I tend to listen to them on a daily basis, 1-2 hours each day during my free time, before bed, when I'm driving or walking, or when I'm doing chores around the house. Podcasts are my favorite type of passive digital entertainment after music (as for interactive, the answer is fairly obvious), and, especially after iOS 7 and automatic downloads, the time I dedicate to podcasts has grown considerably. As you can see, I enjoy podcasts made by independent creators and small networks focused on videogames and tech. For me, the experience of listening to a podcast comprises both topics and hosts: I like well-researched discussions and coverage of news in audio form, but I also like knowing the personalities of podcasters I listen to; I feel like, with time, a weekly podcast becomes similar to hanging out with friends who talk about something I'm interested in. It's a personal, colorful, and ever-changing medium, and I love independent podcasts – even though that means I sometimes have to cope with amateur-level audio, non-descriptive (or non-existent) show notes, and largely off-topic discussions. From a software standpoint, it's both hard and easy to diversify in the podcast client scene: there are many design decisions you have to make when building a podcast app, and some of them are harder because of the nature of podcasts – which involves text and audio, regular new content, metadata, downloads, streaming, and more. You can focus on several aspects of podcasts: you can build an app that prioritizes listening controls and artwork presentation; you can decide to add support for video podcasts; you can instead focus on discovery and social sharing; or, you can try to support every imaginable facet of modern podcasts. In theory, making a podcast app sounds simple because "you just need to play some audio and show subscriptions"; the practical reality is more complex and nuanced. The App Store has long been graced with solid third-party podcast clients, especially after iOS 7 removed the hurdle of manually downloading new episodes with automatic background downloads. Just over the past year, I've switched between Instacast, Castro, and Pocket Casts, settling on the latter as it offered a combination of what I was looking for: a clean interface with sync across the iPhone and iPad, search, and good support for show notes and playlists. For developers of third-party podcast apps, iOS 7 significantly lowered the barrier to entry, which has turned the podcast client into the kind of app many have approached to get started with iOS development. A playground, I would argue. At the same time, the technologies introduced last year have allowed established podcast clients to become even more powerful and flexible after years of iterations and refinements. Both for new and longtime developers of podcast apps, the past year – partly thanks to the growth of the medium itself – has transformed a niche into a larger market on the App Store. Diversification may not be good for developers – there are now hundreds of podcast apps to choose from – but choice is good for customers. Apple hasn't spent the past year waiting on the sidelines, either. With a series of updates to iTunes on the desktop and its iCloud backend for mobile devices, Apple revised the Podcasts app for iOS 7 with a cleaner interface, more reliable sync with Macs running iTunes, and better organizational features. After neglecting them for years, the company added proper support for show notes in Podcasts 2.1, enhancing the app with a Siri integration currently not available to third-party developers. Apple's Podcasts app has gotten better over the past few months, but, overall, I believe it's still not a great solution for people who are into podcasts. The fact that Podcasts will become a pre-installed app on iOS 8 and that Apple announced support for CarPlay indicates that the company is considering exposing podcasts to a larger audience, albeit with the same focus on covering the basics that has characterized the Apple's recent native app additions to its mobile OS. Marco Arment's Overcast thus enters a crowded market that offers plenty of options for casual users, podcast geeks, and people who are mildly interested in listening to podcasts on a weekly basis. After trying the app for the past two months, I believe that Overcast walks the familiar-but-different line elegantly and subtly: Overcast comes with the basic features of modern podcast clients, doesn't attempt to cover all the possible functionalities in its 1.0 release, but also provides unique ideas and enhancements that haven't been offered (or have only been partially implemented) by third-party podcast apps before. It's a trite expression, but Overcast is opinionated – in a good way. 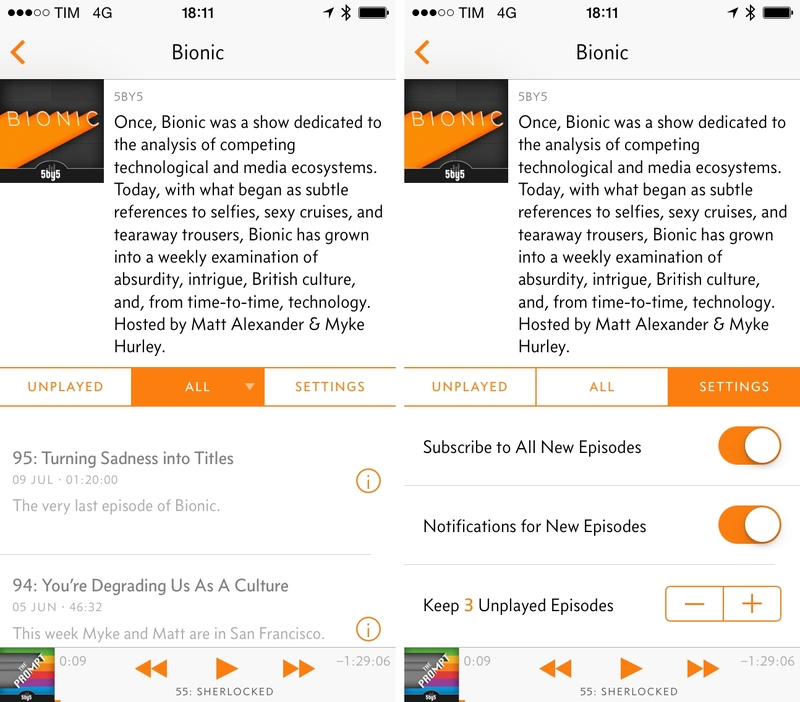 Overcast has the features you'd expect from a podcast app on iOS 7. You can import and export your subscriptions with OPML files, you can create playlists, and you can add new podcast from a dedicated Directory section that showcases editorial picks and has a search bar. Of course, there are notifications for new episodes and background downloads. 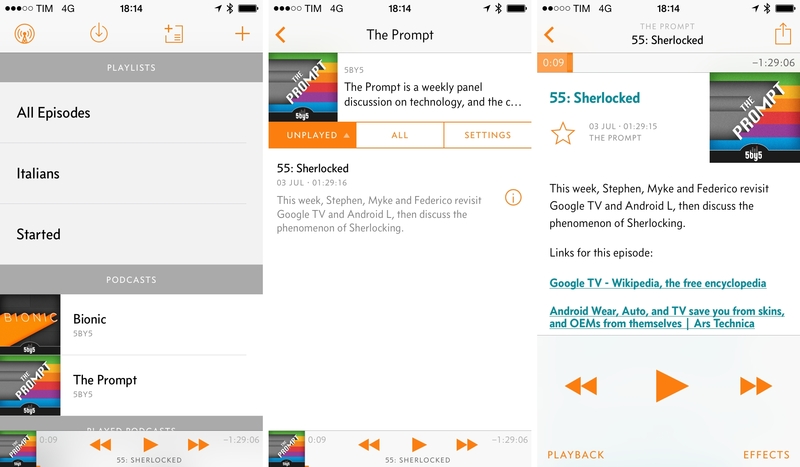 Overcast's progression: playlists and podcasts; individual show; show notes in the playback screen. Show notes are integrated in the Now Playing screen, where you can swipe up to shrink a show's artwork to view descriptions and links. Unlike other audio apps that tint the user interface with colors from the artwork, Overcast is based on white, orange, black, and gray tones that permeate the entire app alongside a pleasing attention to typographic choices, interactive elements, and layout. Overcast doesn't try to follow design trends of iOS 7 too hard: transparencies are used sparingly, and interactivity is suggested through the use of font weights and styles rather than colors or blurs alone. Overcast strikes a good balance between sophisticated and friendly, intriguing and classy without being tacky or boring. One of the app's best design touches, an animated EQ bar that's overlaid on episodes and the playback screen, reflects Arment's attention to detail: unlike Apple's similar graphical indicator, the bar moves according to audio generated by the app – it's not fake, and it's a playful representation of what you're listening to. From a structural standpoint, I'm a fan of the decisions that went into the layout of Overcast and its various sections. On the main screen of the app, three lists divide your Playlists, your Podcasts (with unplayed episodes), and your Played Podcasts in alphabetical order. 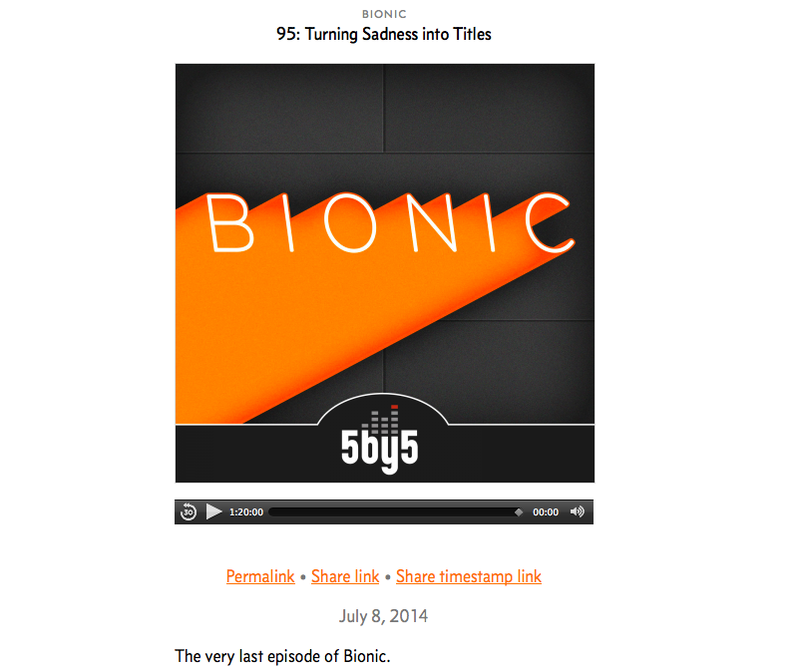 Individual shows are presented with artwork, description, and host information at the top, with three tabs for Unplayed, All episodes, and per-podcast settings (for downloads and notifications). Episode navigation and podcast settings in Overcast. I like this organization because it matches the way I think about subscriptions (they're either new and unplayed, or I want to see all episodes with controls for chronological and reverse-chronological order), which several apps get surprisingly wrong or make unnecessarily cumbersome. Playlist creation in Overcast also offers a mix of straightforwardness and options that I appreciate. 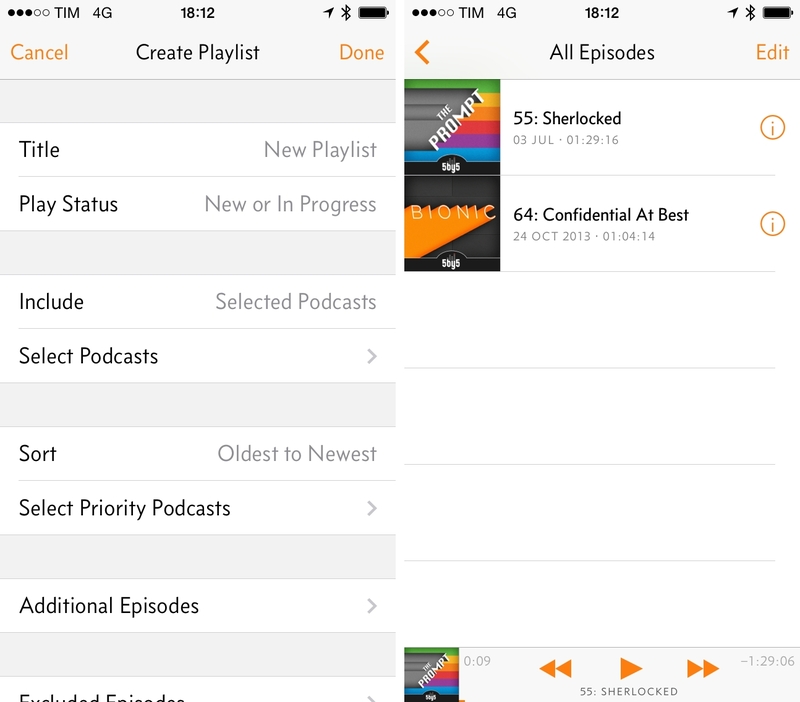 Playlists can include selected podcasts or all podcasts except selected ones; they can show episodes that are new, in progress, or that have been deleted within 1 day, 1 week, or 1 month; you can sort from oldest to newest by podcast; priority podcasts can be selected and you can also specify additional or excluded episodes. Again, some podcast apps feature the same controls, but Overcast explains playlist creation concisely without confusion or obscure terms. In my Overcast, I have playlists for all new episodes, Italian podcasts, and episodes that I've started and that I need to finish listening to. Overcast requires the creation of an overcast.fm account, which, right now, is used for backup and sync of podcasts and progress, as well as notifications for new available episodes. Like other clients, Overcast is powered by a web service that constantly checks podcast feeds for new items, preventing an iOS device from doing the heavy-lifting itself and consuming battery life or being slow in trying to see if a new episode has been published. In my tests, Overcast's notifications have been fast and timely (and faster than other clients), and I never had issues with missed notifications or delays. 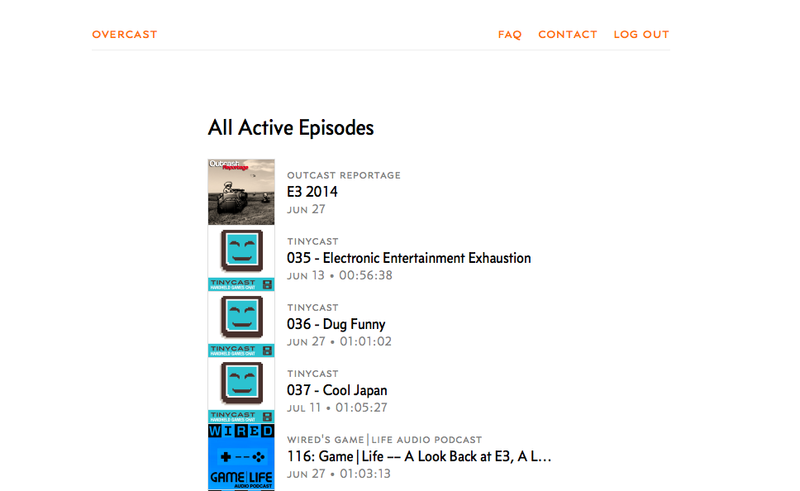 As of today, Overcast comes with a web app that offers basic access to your active episodes and subscription list. You can play episodes in a web browser, and Overcast's backend will sync playback position across the iPhone and the web, which I found to be a handy addition for those rare times when I don't want to listen to audio on my iPhone. I like that I can browse all episodes for a selected show on the Overcast website, and I'm a fan of the simple web player that packs a timestamp sharing button to share a link to a show at a specific point (the link will redirect to the Overcast web player, which will automatically advance to the shared timestamp). There's a lot of missing functionalities from the Overcast web app, though, such as playlists and further management features, and I'm looking forward to improvements to the website after today's launch. Where Overcast deeply differentiates itself from the competition is in the Now Playing screen, and not just from a design perspective with its swipe gesture to view show notes, but thanks to unique features for playback and effects. iOS podcast apps generally rely on Apple's AVPlayer framework to handle playback and speed rate controls using speed labels that aren't usually accurate. Users typically don't notice the factual inaccuracies of mislabeled playback speeds, mostly because Apple used them in their own app; personally, I never listen to podcasts at higher speeds, as I find it strange and unsettling. Arment wrote about this topic before, if you're interested in a technical read. For Overcast, Arment wrote a Core Audio engine from scratch to support speed-accurate controls and two of the app's most important features: Voice Boost and Smart Speed. Available in the Effects panel of the Now Playing screen, Voice Boost raises and normalizes volume to make podcasts sound louder (but not too loud) and equalize audio levels. There is a lot of complexity involved in Overcast's engine and how it differs from traditional compression and boosting techniques of built-in iOS frameworks, but, in practice, Voice Boost makes podcasts sound better, in a natural way. Here's an anecdote that I used to describe Voice Boost in my everyday life during the Overcast beta testing: I usually listen to podcasts while I'm washing dishes, and I often can't hear voices from amateur-level (from an audio, not quality standpoint) shows over the noise of tap water. With Voice Boost, Overcast raises and equalizes volume just enough so that I can put my iPhone on the windowsill next to me without having to connect my Bose SoundLink Mini. Smart Speed is even more impressive, with practical benefits that are immediately noticeable when listening in Overcast and looking at the app's interface. Built on top of an advanced speed algorithm that isn't generally used by iOS audio apps, Smart Speed is a dynamic silence skipper that works on top of any speed you choose in the app. 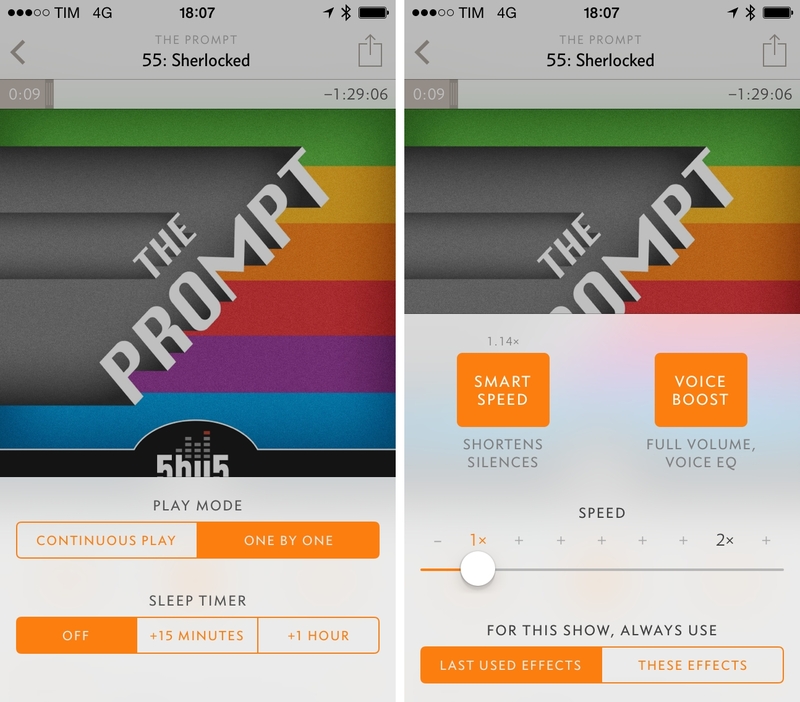 Smart Speed quickly analyzes a downloaded episode and, as you listen, it skips tiny portions of near-silence that you're unlikely to notice, giving you "free" speed and letting you save time without making voices sound crazy or robotic. The silence skipper is invisible, natural, and it makes shows sound tighter and more professionally-produced without compromising their nature or making people sound like androids at 2x. Effectively, it's unlikely that you'll ever gain a 2x speed increase with Smart Speed, but the 1.10x and 1.30x adjustments (what I've been getting on average in Overcast) will be noticeable and they will save you time without being unpleasant to hear. Smart Speed works, but it doesn't get in the way, and I find it to be a genius addition to the app. A new Overcast installation vs. an Overcast that has been using Smart Speed for a while (thanks, Myke). The big trade-off involved with implementing Smart Speed is that Overcast requires downloaded episodes and doesn't support streaming in this first release. While Arment is working on a solution for iOS 8 (more on this below), this means that users who want to quickly listen to an episode by streaming it without downloading will be unhappy with Overcast 1.0, as it always defaults to starting a download upon tapping a new episode. Coming from Instacast and Pocket Casts, I thought that the lack of streaming was going to be a deal breaker for my podcast listening setup; after using Overcast intensively since May, I haven't missed streaming support thanks to fast notifications and automatic downloads, and I'd rather have the ability to apply Smart Speed than streaming shows. I've been listening to podcasts with Voice Boost and Smart Speed always on, and after trying to go back to other apps (such as Apple's Podcasts, Instacast, Pocket Casts, and Castro), I realized that I was really missing the enhancements and time savings provided by Overcast. I've never listened to podcasts on 1.5x or 2x: every time I tried those settings – even in the updated Castro app – I came away thinking voices sounded weird and had strange artifacts. In Overcast, Smart Speed's dynamic nature and silence-skipping engine is not only technically impressive – it's a pragmatic addition to the app that, combined with Voice Boost, makes Overcast the best podcast listening experience I've ever had. 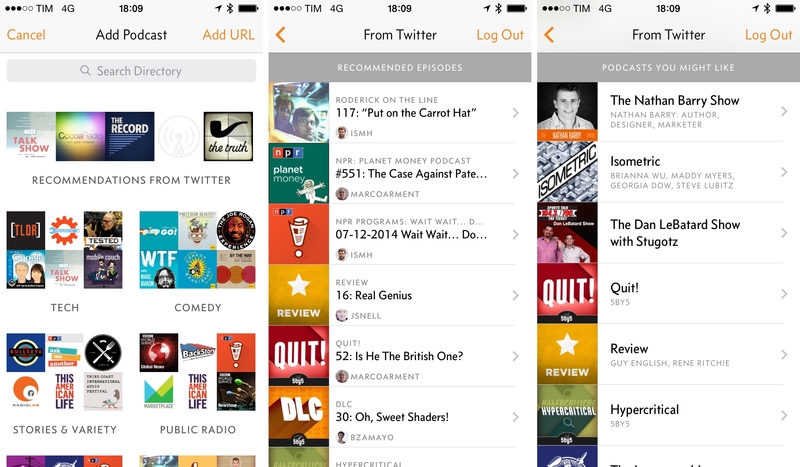 Overcast offers a Directory section with recommendations, editorial picks, and search. Curated podcast selections are organized in categories: recommendations are solid and diverse, and they include names such as ATP, Mac Power Users, Roderick On The Line, The Brainy Gamer, Stuff You Should Know, and 99% Invisible. If you're new to podcasts, Overcast's Directory is a great place to get started, and I like its variety. Overcast recommendations include a directory with search, episodes recommended by people you follow on Twitter, and suggested shows. I'm more impressed by Arment's idea of replicating Instapaper's old Friends "social network" with personal podcast recommendations based on Twitter. Once you've given read-only access to your Twitter account to Overcast (so it will never be able to send tweets), the app will look at your social graph and give you episode and show recommendations from people you follow on Twitter, as it assumes those are people whose opinion you care about. For shows, the process is entirely automatic and anonymized – you'll get a "Podcasts You Might Like" section in the Twitter recommendations, but you won't know who is subscribed to what. For individual episodes, on the other hand, you'll be able to manually recommend an episode by tapping the star button in the share sheet or next to an episode's title in the show notes. This gesture is reminiscent of Instapaper's Like button for articles: episodes you like will be advertised to people who follow you on Twitter and who have decided to get Twitter recommendations from Overcast, but they won't be automatically tweeted or shared anywhere else. I'm a fan of the easy sharing and passive recommendations built on top of Twitter because they remove pressure from publicly posting a link to an episode and because they're always there, always updated in the background, ready to be viewed when you're looking for something new without getting in the way or spamming you with notifications or other social hooks. There's an argument to be made about podcast discovery and evolution of the medium as it becomes more popular and easier to produce, but Overcast doesn't want to address that, at least not from a big picture perspective. With editorial picks and Twitter recommendations (and, notably, lack of Top Charts), Overcast isn't reinventing the way podcasts are discovered and shared, but it removes friction from getting started with podcasts or finding more shows to listen to. I've already discovered a couple of interesting podcasts thanks to Twitter recommendations that I wouldn't have found otherwise, and, if Overcast's freemium model works, more people using the app could result in more recommendations for popular and lesser known shows, which should help podcasters finding new audiences through the app. It's a clever idea, neatly integrated with the app. Arment had his reasons for making Overcast free with IAP, a topic that I discussed with him in our interview (available below). I believe that the limitations make sense and add value to the $4.99 purchase, and the way Overcast lets you try effects for 5 minutes at a time (to get a taste of Smart Speed, Voice Boost, and variable speeds) is a smart mechanic to get people to try the premium features before buying. There is value in the free version of Overcast (and the "free" price tag will certainly entice people to try the app, even if only out of curiosity), but the app is clearly meant to be enjoyed with a fully unlocked feature set. For my personal use case, I like the paid additions besides Smart Speed and Voice Boost, especially per-podcast effect settings, one-by-one playback, and the sleep timer. I've never been a fan of the continuous playback popular among podcast clients, as I like to choose what to listen to after an episode has ended3. The Sleep Timer could have used increments of 5 minutes in addition to 15 and 60 minute shortcuts, but at least you can tap each shortcut multiple times to add minutes to the timer. Per-podcast effect settings are the perfect addition to Voice Boost and Smart Speed: because you can select to automatically apply last used or specific effects to a show, you can decide to load a well-enginereed show with only Smart Speed enabled, leaving the combination of Smart Speed and Voice Boost for other shows. In testing Overcast, I collected a series of delightful details that improve the app in small but notable ways, as well as minor annoyances that I'd like to see improved in the future. Overcast has a URL scheme to add new podcast. Using the overcast://x-callback-url/add?url= scheme, you'll be able to subscribe to new shows in Overcast by launching the URL from other apps such as Launch Center Pro, Drafts, or Safari. Here's a Launch Center Pro action and a Safari bookmarklet to send the clipboard or current webpage to Overcast, which will parse the URL and find the associated podcast feed. Overcast's URL scheme also supports x-callback-url, which is good news for iOS automation workflows. Overcast uses the Concourse font by Matthew Butterick, which is a beautiful typographic choice that scales well and looks great on Retina devices. When you tap a podcast that has unplayed episodes, Overcast defaults to opening the show's Unplayed tab (restoring your previously selected sorting preference, which is global); for played podcasts, the app opens the All tab by default, letting you browse every episode you've already listened to. Episode titles and links in the show notes are tappable, and Overcast has a built-in web view that doesn't automatically open Safari. This in-app browser has a share sheet with options for system sharing services, plus custom Instapaper and Safari buttons. Download errors are shown with a frowny face badge instead of the usual "!" or "x" symbols, which is a nice touch. The Settings icon is an Overcast glyph instead of the usual gear. I believe this reinforces the idea that you're opening the Settings to modify your Overcast preferences, and it adds a bit of personality to an otherwise regular toolbar. Playlists can be modified and you can reorder episodes inside them. Just open an existing playlist, tap the Edit button, and you'll get the ability to manually modify how a playlist works or the order of episodes inside it – useful if you rely on continuous play but want to slightly tweak what a playlist gives you next. Skipping speed increases if you tap the seek back/forward buttons repeatedly, allowing you to move back and forward within an episode quickly (a concept that reminds me of Logacal's logarithmic scrolling and that I wish Apple added as a system gesture to the OS itself). The show note swipe gesture is hidden. You can get to an episode's notes by swiping up on the playback screen, but there's no indicator or visual hint that a gesture can be performed on the artwork or that content is available underneath playback controls. The gesture is arbitrary – show notes are there because they're there – and while it's possible to read descriptions by tapping the "i" button next to an episode, there should be a better way to know that artwork can be swiped up. Perhaps a bounce effect similar to Apple's hint on the iOS Lock screen could help. Tapping and holding links opens a contextual menu that's different from the share menu you get in the in-app browser. Perhaps this is system behavior, but it means that getting the full menu for a specific link requires you to open the web view first, which can slow you down if you already know you want to save a link for later or share it. There's no way to know how many unplayed episodes a podcast has from the main screen. I despise red badges and other ugly reminders of something I haven't read or done, but the number of available episodes could perhaps be integrated with metadata in the main screen. I would have liked a different name for the Voice Boost effect as it doesn't simply boost a show's volume. I'm nitpicking (the text labels explain effects anyway), but that's exactly what this section is for. I sometimes accidentally trigger downloads when tap on the info ("i") button next to an episode. I've tried dozens of times and I've asked other Overcast users – the tap area should be larger. The Recommend button can be confusing, as it's shaped like the star that's usually associated with the concept of bookmark or favorite. While the idea is that you're marking a show as favorite, the button doesn't suggest that it will be a shared favorite recommended to others, and, at first, I struggled to understand whether the button came with a dedicated Favorites section or not. The fact that the same button is labelled as "Recommend" in the share sheet helps, but the app should do a better job at explaining what the star means and what it does. When you open iTunes and mailto: links in Overcast, the app redirects you to iTunes/App Store or Mail, respectively, but it leaves a blank page open in the in-app browser, which is not an elegant solution. I don't know what the best alternative would be, but perhaps using modal panels for iTunes media and composing email messages could work. While testing Overcast and writing this review, I had a chance to ask Marco Arment a few questions about his new app, the App Store market, and design decisions behind a product that took several months to build. Back at XOXO last year, you said that you had a constant fear of waking up one day and finding out a service had copied Instapaper and was launching another competing app. Then to diversify from Instapaper, you launched The Magazine, but you said that it was also built out of fear thinking that someone else would beat you to the market or copy it. Now with Overcast, you're entering a crowded market and, again, there's always the possibility that other developers will be "inspired" by Overcast and attempt to copy some of its features. How do you feel this time? Is there a different kind of pressure in launching Overcast? To some degree, that's unavoidable. Any developer can make a podcast app with enough time and motivation, and none of Overcast's features are impossible to copy. What helps with a podcast app, I think, is that there are tons of big and small design and priority decisions that each developer makes along the way. These decisions add up to radically different apps — I can't point to any two podcast apps in the store today that are very similar to each other in actual use. So even if other apps match my feature checklist, I'll always have people who will prefer my style (and people who won't). Tell me more about Overcast's unique audio enhancement features. How did you come up with the idea? Are they built completely from scratch or are you using some open-source technologies? How do they differ from similar controls in other podcast apps? I have plenty of crazy ideas that end up not working, and I initially thought this would be one of them, especially Smart Speed — I didn't think it would be possible without hearing artifacts, and I didn't think iOS hardware could do it in real time without killing the battery. In October 2012, I took a couple of weeks to learn Core Audio and build a prototype named Castaway to see if Smart Speed and Voice Boost could sound good and run well on an iPhone. It turned out much better than I expected. Not only could Smart Speed sound transparent, but with the right tweaks, it was able to save a substantial amount of time without making conversations sound unnatural. The combo made everything sound tighter and more professionally produced — levels were fixed, joke timing got better, amateur speakers sounded more confident, and it made amateur-produced shows (my favorite kind) easier to listen to. I still owned Instapaper and The Magazine at the time, so I couldn't devote a lot of time to this experiment. I still wasn't sure if I wanted to make a podcast app — it's a lot more work than just making an audio-processing demo. But I occasionally found time to work on it, and over the following months, I experimented with different processing techniques and third-party libraries like DIRAC. But none of them were a better fit for my purposes than the raw Core Audio code I wrote. And that's what eventually made it into Overcast. Other podcast apps generally use the higher-level AVPlayer framework. It saves a lot of time and complexity at the expense of flexibility. As far as I know, there's no reasonable way to implement Smart Speed with AVPlayer. By working at the lower levels, I also have much finer-grained control over behaviors such as dynamics processing and variable-speed audio quality. The downside is that I had to do much more work to get the basics in place. This is one reason why other apps offer streaming, but I don't yet. Streaming comes easily with AVPlayer, but I need to write most of mine from scratch. But with AVPlayer, you're limited to streaming or downloading. You can't save the streamed data or play a partial download. When I finally finish my implementation, I won't have that limitation. One approach isn't universally "better" than the other. I'm willing to spend months down a rabbit hole of complexity to offer a few features that I really love. But using the higher-level frameworks gives other app developers huge advantages in time-to-market and ongoing maintenance. And there's no guarantee that the market will reward my approach — effort doesn't always equal value. How would you explain Overcast to the average App Store user who's probably okay with Apple's Podcasts app? There's no reason to settle for just being "okay" with an app that you use every day. With Instapaper, you had built a text parser that depended on HTML code and articles from other websites in order to work correctly. With The Magazine, you had to pick writers and their articles and select which ones were worthy of the app. With Overcast, it seems like it's the first time you're making an app that works with content you don't have control over or aren't responsible of otherwise. At XOXO, you noted that there's no platform lock-in for the podcast medium, which in most cases adheres to the standards of RSS and iTunes feeds. What are the challenges for this no-lock-in approach? Do you feel responsible in other ways or for other services you provide, like notifications? The content side of Overcast is much easier than my previous projects. Not only are feeds easier to process than arbitrary web pages or humans with feelings, but podcast feeds are even easier to deal with than most feeds because iTunes has historically been very picky with what it would accept. So nearly everyone's podcast feeds are well-formed and standards-compliant. I'm still responsible for some of it, like the podcast search and directory, and the challenges that go along with those like broad inclusion, fast updates, editorial decisions, and spam control. And of course I'm responsible for the entire server-side infrastructure, which includes the syncing, podcast updates, push notifications, and account management. But there's much less constant daily maintenance, which I appreciate. What was the thinking behind pricing Overcast and presenting it to a market where "freemium" apps with IAP are increasingly popular? Overcast is free with limits, with a single $4.99 in-app purchase to unlock everything. It's an approximation of a paid app with a free trial, although many people will never want or need to pay. Instapaper was always a paid-up-front app, it worked very well for years, and I learned a lot from it. But I also made that decision in 2008, and it's a different market today. There's simply far more competition in nearly every category, and more customers than ever expecting apps to be free up front. I don't think most types of iOS apps can sustain healthy revenue as paid-up-front anymore. When I consider the competitive landscape, I don't spend a lot of time worrying about the other indie podcast apps that cost a few dollars each. I'm looking at Apple's Podcasts app, which is free, mediocre, and the most popular podcast app in the world by far. And that's not just because it's built in: Stitcher is the second-most popular, again by far, and it's a free third-party app. So it's clearly possible to do very well as a third-party podcast app. I learned long ago with Instapaper that there's a vast number of people out there — certainly the majority of iOS users — who will never even consider a paid app and have never bought one. I decided with Overcast that while I still need enough people to pay for the app to keep the lights on, I also want a large userbase so I can have a meaningful effect on podcast listening and discovery. So if someone's only willing to use free apps and will never pay, I'd still rather have them using Overcast than another free app. I personally love the Twitter recommendation feature of Overcast and the way it helps discoverability without requiring a completely new social network to maintain. In a way, it's reminiscent of Instapaper's old Friends functionality. Do you think the podcast medium has a discovery "problem" that needs to be fixed, or do you simply want Overcast to help smaller shows find audiences through a nice app feature? A lot of podcast producers say podcasts have a discovery problem, but I don't know if it's as big as they think. Plenty of people don't listen to podcasts, but there are also lots of podcast listeners who want to listen to more, but don't or can't make the time, and they let their shows pile up so they only end up listening to This American Life and deleting the rest. My goal with Overcast was less about getting new listeners to the medium and more about helping people who've already decided they like podcasts to listen to more of them, and try to get them to explore beyond the handful of famous public-radio and big-network shows. That said, there's more that podcast apps can do to help discovery. Most people I know listen to podcasts in isolation: they rarely mention what they listen to on Twitter or write about it on blogs. And that makes sense, for the most part, since they're different contexts and media. I don't post on my blog about every TV show I watch, either. And many people listen to podcasts while doing something else — walking, driving, etc. — that precludes easy sharing while they do it. So it's not enough for podcast apps to only offer shareable links, since so few people actually use them. That's why Overcast's Twitter feature is a combination of actively recommending specific episodes, which most people probably won't do but it will carry some weight when they do, and passively using subscription lists and Twitter's social graph to suggest new shows, which I bet many people will opt into. And the difference in context between Twitter and podcast listening is also why I've opted to take read-only Twitter tokens. I'm not asking anyone to spam their timeline with anything. It's a low-cost, low-risk, low-commitment sharing network. Pick one thing that you love about your app and another that you want to improve soon. I love the audio engine. I've been using Overcast full-time for almost a year, and when I hear another app that doesn't have Smart Speed or Voice Boost, I really miss them. I really need to add streaming, though. That's a huge missing feature. I already know how I'm going to do it, but it requires an iOS 8 API to do it well, so it'll come sometime after iOS 8. What was the most challenging screen to design in Overcast? Definitely the playback screen. I went through many iterations before the current one — different control sizes and positions, scrolling the button area with page dots, a mini tab-bar, different buttons in the corners. It's very hard to get it right and has many conflicting pressures, which is probably why every podcast app has a different take on it. It needs to have every control within easy reach, yet give every control enough space that you're not accidentally hitting the wrong thing, not be intimidating or complex, and try to look decent. If everything works out well, what do you have in mind for the future of Overcast? I plan to run it for a long time, but I intentionally haven't planned specifics too far into the future. The market's always changing, and I need to leave room to adapt to what my customers tell me. I'd like to knock out the big new features like streaming, and make a proper iPad app. Maybe a Mac app someday. Otherwise, your guess is as good as mine. I was discussing Overcast with my friend (and partner in crime) Myke Hurley a few weeks ago, and I noted the impact that Arment's app would have on podcasts with amateur-level production or general audio issues that could be fixed or enhanced by software. "What I love about Overcast is its hidden power", Myke noted, adding that "Overcast is an app that lets you choose to become a power user. It's immediately accessible to all, but if you want to unlock its real power, you can", and I believe that's a great summary. Overcast is both simple and complex, and its success lies in the harmonious and tasteful balance between familiarity and a custom audio engine, standard controls and new features such as Twitter recommendations and Smart Speed. 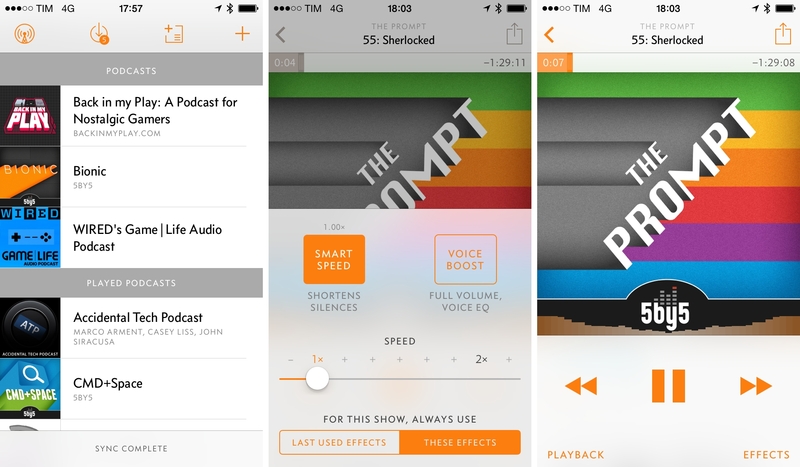 Overcast is a polished, powerful, and useful podcast app that marks a solid iPhone debut. Overcast doesn't fundamentally reinvent podcast discovery or presentation to the masses – whether that needs to be done is still up for debate, and likely always will – but it manages to cover the basics of podcast listening while providing unique features that make it, as I like to say, a typical "Marco app". It's simple, focused, and elegant, but it's got those couple of features and touches that make it stand out. Unlike previous apps by Arment, Overcast doesn't usher in new App Store categories or trends (such as the Newsstand magazine or read later app), but it manages to augment the classic podcast client for iPhone with functionalities that I'm now missing from other podcast apps. Smart Speed, Twitter recommendations, and Voice Boost are great additions that I now expect from a podcast app and that seem obvious once you get used to them, even though they actually took several months to be built and perfected. These kinds of features and interface decisions that disappear in the background and become natural tenets of an app are hard to get right, as it's easy to get carried away and make them prominent to the point that friction becomes a problem. From an implementation standpoint, Arment did an amazing job with the audio engine and the balance between Overcast's geeky nature and mass appeal, its sophisticated design and intuitive interactions. Overcast has minor 1.0 flaws; it's not available on iPad and OS X; its web counterpart is limited (but still useful); and, of course, its business model is a big question mark that only time and App Store customers can answer. 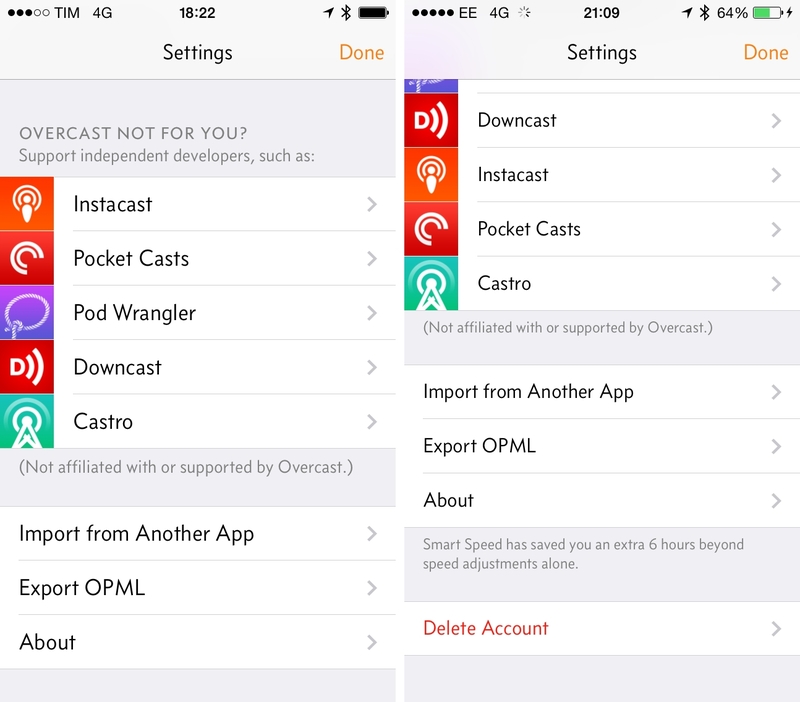 The app has also been released at an interesting time – a couple of months ahead of iOS 8, with Arment noting that new APIs in the next version of iOS will allow Overcast's engine to handle streaming and other features that are not possible right now. Overcast proves that an established app category is always ripe for innovation with the right technologies, ideas, and taste. I've tried many podcast apps over the years, but Overcast, thanks to its unique features and elegant design, is my new favorite. Overcast is free on the App Store.